Consider your current marketing strategy. What systems do you have in place to reach new moving leads/clients and retain contact with existing clients? Have you ever spent your time cold calling one hundred prospects, only to have two moving leads? Have you ever spent hundreds or even thousands of dollars on magazine or newspapper ads, but the ROI (Return on Investment) is way too low? Do you feel that your advertising costs are too high? Take a positive step towards ensuring a successful future for your moving company by taking a fresh look at your marketing strategy. 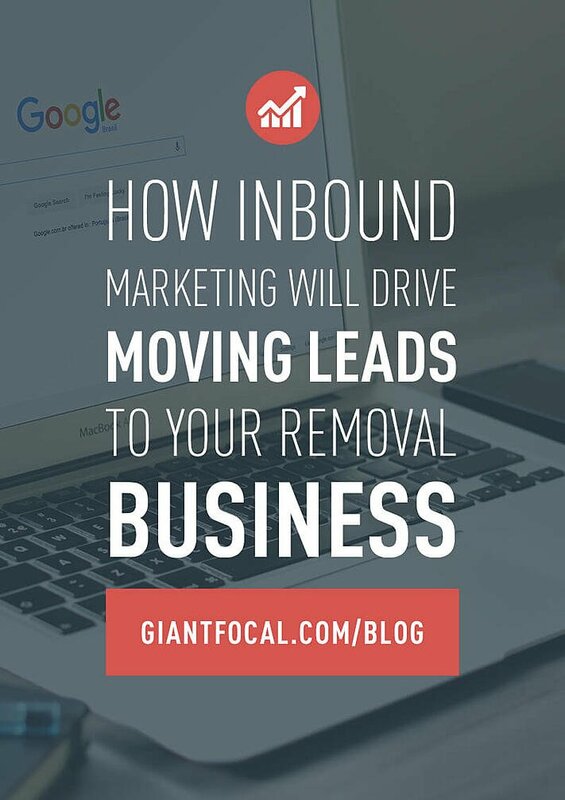 Traditional, or outbound, marketing may promote your moving services to a certain extent, but if you want to see remarkable growth in your company, you should give inbound marketing a try. Some of you might be wondering by now, what on earth is inbound marketing? If you are one of them, great, read through the slides below before you continue reading this article. When implemented correctly, inbound marketing will enhance your other sales actions to create interactions that help you reach your targets. Cold calling, pamphlet distribution or advertisements in local newspapers, have their place in the world of marketing, but newer and greater systems are here for those who want to expand beyond the boundaries of outbound marketing. With the advancement of technology, your prospective clients have huge amounts of information available to them at the click of a button. Nowadays, most people are looking for information and shopping online. So why bother finding them in the places where they are not present? In all honesty, what is quicker? Paging through a newspaper to look for a specific advert for a removal company, or typing “local moving company” and find hundreds of even thousands of suggestions? How many times have you ever seen an ad on a magazine or newspaper, and you thought "This is good! I will need to call this moving company when needed one day", and when the time comes, you just forget where that magazine/newspapper is? 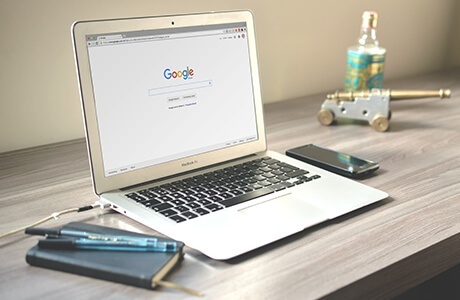 It’s so much easier to turn to Google, Bing or any other search engine and find a removal business quickly and conveniently online. If you have a moving business, but your details are nowhere to be found on the internet, how will clients, who prefer to search online, ever find you? Good question isn't it? It's for you to think about. It’s time for your removal company to move forward. Use the tools that inbound marketing offers and you can overtake your competitors. 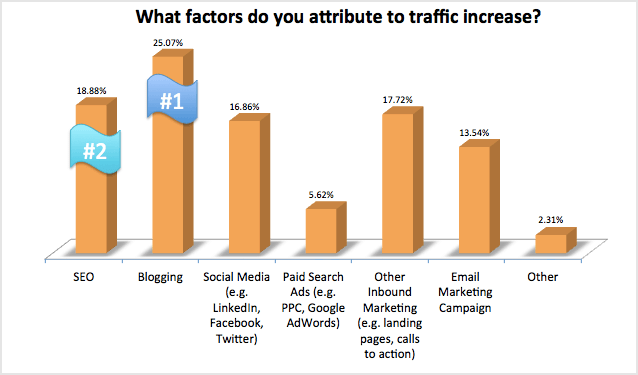 In 2013, HubSpot did a research about the impact of inbound marketing upon a website in terms of traffic increase. And yeah, the results are pretty much guessable. 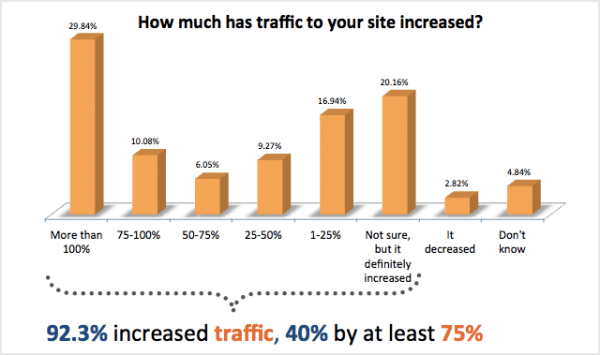 92.3% of businesses do experience an increase in traffic. And 40% has a 75% of increase! But wait, how long does it take for the strategies to take effect on my website's traffic? Wel... effects sure will vary among websites, but on average, here is the data that HubSpot has gathered for us. There you have it. 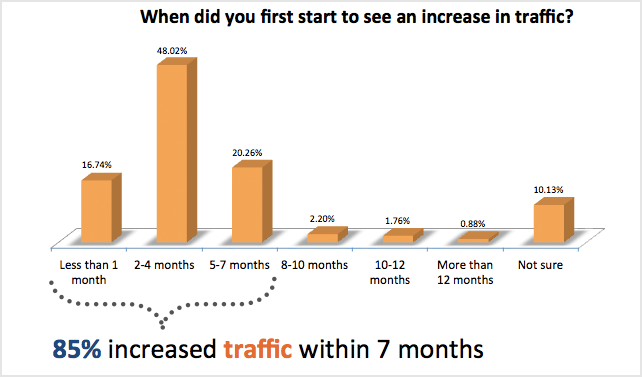 85% of the websites that apply inbound marketing strategies experience 85% traffic increase in only 7 months! If this heading sounds like a foreign language to you, don’t fade out on us now. It’s simple to explain and easy to grasp. In essence you need to be found amongst all the competition out there. Considering the fact that people who are searching for moving companies online are aligned with the service you have to offer – you are half way to establishing a lead. The place where people become leads, who will hopefully convert to customers, is your website. Setting up a comprehensive, user friendly website is the first step in your inbound marketing strategy. A great website can make a small business look bigger. In the bar-graph above you can see that blogging, SEO, social media and other inbound marketing strategies work best at increasing traffic to your website. Taking this information into account, it would make business sense to optimize these areas. In order to attract more traffic to your website you need to branch out into the other areas of inbound marketing. Your content has to be SEO friendly for your website, and in turn your company, to get noticed amongst the clamor in the advertising world. Using key words that are relative and applicable to your line of business, means that search engines will be able to sort through your online content and highlight your data during a product or service related search. Let us start by discussing a blog. People (your moving leads-prospects) who are browsing, or searching for specific content, can be directed to your blog site if you have optimized your key words. It is advisable to blog regularly so that there is new content available. Why though? A good example would be: when you pay your favorite t-shirt store a visit, are you looking for new shirts or old collections that you have seen for ages? Your blogs visitors are also the same! When they pay your blogs a visit, they expect new content. Your blog will serve you well if it is targeted at your desired audience, in this instance, people who need a removal service. Your blogs can include tips to help make the moving process easier for your readers – this will help them discover that you are trustworthy. Remember that trust is very first component that every business has to work hard for to become the market leader. You could also blog stories of amusing or eventful house moving experiences – this will remind your readers that you are human. A well-constructed blog will encourage your readers to explore the rest of your site. What other social media platforms are available to you? Facebook, Twitter, LinkedIn, Instagram and Pinterest are the big five of social media marketing. Used individually or en masse, they can help grow your business by extending your reach. Be sure to link all your social media accounts to each other and back to your website. In some cases, this happens automatically if you use the same email address to create all your social media accounts. As with your blogs, your posts must be relevant to your line of business. The main point is to optimize your visibility. Therefore, if you own a furniture removal company, it isn’t going to help you much if you post recipes – unless the recipe is for “easy to make, moving day tacos” then be sure to use the right key words. Another great word of advice for your moving business’ social media accounts would be to follow businesses that are related to yours. For example, real estate agencies, landscaping companies, storage facilities and other local, small business owners. Why though? The reason is simple, this will aid in your growth as they may follow you back and even refer you to their clients. People are more likely to recommend someone they have made a connection with, and word of mouth advertising is very powerful. The costs of getting your inbound marketing strategy up and running are small compared to the ongoing expense of renewing and recreating outbound advertisements. The return on investment will be well worth the effort. You’re reading this article online now aren’t you? What are you waiting for? There is no better day than today to implement the strategies you need to transport your removal business to generate even more moving leads and great success.